The last will and testament message is used to notify subscribers of an unexpected shut down of the publisher. If the broker detects a connection break it sends the last will message to all subscribers of that topic. In this Example I will be using a 2 python scripts that represent two clients called Python1 and Python2. One client is used as the subscriber to some topics and the other script is used to publish messages on those topics. The objective is to see what happens when the publisher gets disconnected. Use a client to publish messages. The publisher will set a last will message for a topic. We monitor the publisher using a subscribing client. We break the connection between the publisher and broker first using an normal disconnect and secondly using an abnormal disconnect. In this example we disconnect from the broker by sending a disconnect message and note that no Last will Message is sent. 2 The publisher sets a last will message for one (bulb1). 3. The publisher publishes two test messages one on each topic. 4. The subscriber sees these messages. In this example we disconnect from the broker by simulating a network fault and note that a Last will Message is sent. 5. The connection between the publisher and broker is broken. .I achieved the connection break simply by closing the python IDE for the publisher client. The broker sees it as a socket error. -see broker screen shot below. To set the last will message you use the auxiliary function will_set(). This you must call before you establish the connection. Here is a code snippet taken for my example scripts. Note: Setting a QOS of 1 for the last will message attempts to makes sure the subscribers see it. Setting the retain flag to True will guarantee this even to subscribers that don’t currently have a connection. A client (sensor or device) could publish it’s current connection status on a topic e.g. sensors/sensor1/connection_status. The client would update this status when starting and when disconnecting. The Last Will would then be used to update the status in the case of a failure. The last will message if used is only sent if a publisher is disconnected abnormally. e.g. through a network error. 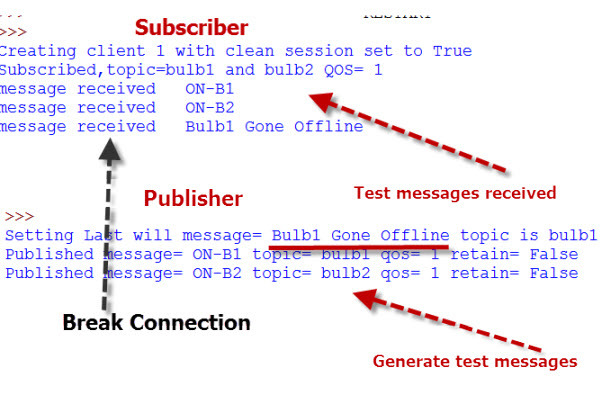 If the publisher disconnects uses the MQTT disconnect sequence then no last Will message is sent. Really good introductory series- Recommended reading MQTT essentials.